You Can Help Our Cubs as They Grow! There are many things that go into our cubs growing and developing in a healthy way. 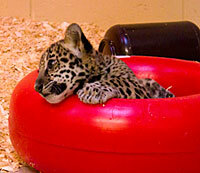 One of the efforts that adds to their development is the use of enrichment items. Enrichment items, like cat and dog "toys," allow the animals to display natural behaviors, just like they would in their wild habitats. 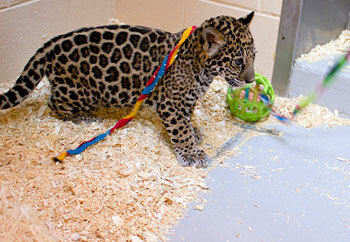 The jaguar keepers have compiled a list of needed enrichment items for the jaguar cubs that can be purchased through Amazon.com. All of the items listed on Amazon can be purchased, and then sent directly to the Milwaukee County Zoo. Click here to view the Amazon.com wish list items. Thank you for considering a donation to our jaguar cubs!